Welcome to our villa La Noria which is located in the town of Javea, Alicante - Spain. We chose for this town because of its mainly unspoiled environment. There is no mass tourism, high rise buildings etc. Just sit back and enjoy the beach, beautiful weather and the many excellent restaurants. Feel free to look around and if you have any questions, do not hesitate to ask us. 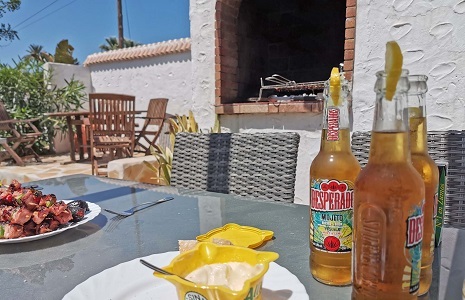 The Spanish villa "La Noria" offers all the comforts from back home. However with a bit of ¨Spanish taste¨. Original arches, marble floors etc. to create that special asmosphere. WIFI internet, airconditioning, SKY tv are all standard. There is a very large garden with a lot of privacy. Right in the middle is the large pool of 12 x 6 meters and covered sitting area. Plenty of sunloungers, shaded sitting areas are to be found. The villa is located in an excellent part of Javea. 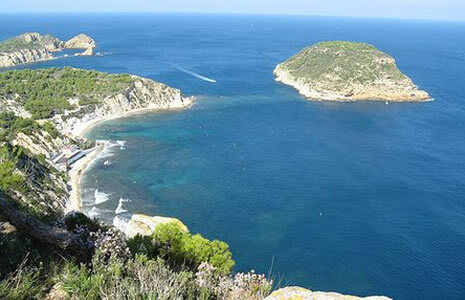 Javea is located on the coast between Alicante and Valencia. The warm climate offers sunny days all year round. From the villa it´s just a few minutes walk to the traditional old centre. Do try the Spanish ¨Tapas¨ when visiting the old church or the Thursday market. To the beach is less then 5 minutes by car. A truly lovely location to enjoy those sunny Spanish days. The villa has a maximum capacity of 10 persons. Arrival and departure is on Saturday. With the < & > arrows you can find the the period you are looking for. Please contact us for the actual availability. The weekly prices include the costs of electricity, water, gas, airconditioning and use of WIFI internet. Exclusive: final cleaning, bedlinen and towels € 179,-(mandatory). The damage deposit for the villa is € 500,-. What does this villa offer, what others don't? The southern faced villa (280 m2) for up to 10 persons, has a private garden (2300 m2) with a lot of privacy.